Zhu Yuling and Ding Ning start as favourites for the forthcoming Uncle Pop 2018 ITTF Women's World Cup, play commencing in Chengdu, China on Friday 28th September. Quite simply their records speak for themselves but so does that of their nearest challengers in the city renowned for being the sanctuary of the Giant Panda. Japan’s Kasumi Ishikawa is the no.2 seed, one place behind Zhu Yuling and one ahead of Ding Ning; compatriot Miu Hirano is the no.5 seed being next in line to Chinese Taipei’s Cheng I-Ching. The challengers, they have one factor in common; all have reached the final of the Women’s World Cup. In 2015 in Sendai, playing in her own country, Kasumi Ishikawa finished in runners up spot, losing the China’s Liu Shiwen; one year later in the Philadelphia, Miu Hirano hit the headlines by beating Cheng I-Ching in the Philadelphia final. In Philadelphia, the tournament was arguably the most open of all, no Chinese star names on duty, the event needed a boost. Miu Hirano provided that boost not only by the uninhibited way in which she played, also by her persona which was one of sheer innocence. A one off performance, a miracle win; the following year at the Seamaster 2017 Asian Championships in Wuxi, she put that theory soundly to sleep; she won the Women’s Singles title. Just note the names of the players she beat at the quarter and semi-final stages. She beat Ding Ning and then Zhu Yuling; in Philadelphia the cynical view was that she had won because no Chinese were present. In Wuxi she beat three in a row accounting for Chen Meng in the final; the doubters were answered in clinical fashion. Equally, let us not underestimate her efforts last year in Markham last year; she finished in fourth place and had she not won in Philadelphia and Wuxi would we not have hailed that result as quite remarkable for a 17 year old? If there is a problem for Miu Hirano it is that the video cameras have rolled, her style has been analysed in microscopic detail; last year she was beaten in the bronze medal contest by Cheng I-Ching, a young lady who seemingly played with an extra degree of determination, following the loss in the previous year. Furthermore, in the Women’s World Cup, Cheng I-Ching has a penchant for turning the tables. In 2014 in Linz, she lost to Kasumi Ishikawa in the opening round; in the same round in Markham she reversed the decision. An early exit last year but of the major challengers is Kasumi Ishikawa not the greatest threat to Chinese excellence? Now 25 years old, she is more and more a member of the experienced brigade. On debut in 2011 in Paris she finished in third place in her group behind Hong Kong’s Tie Yana and Germany’s Wu Jiaduo but ever since that date, she has always advanced to the main draw; in recent times receiving a direct entry. 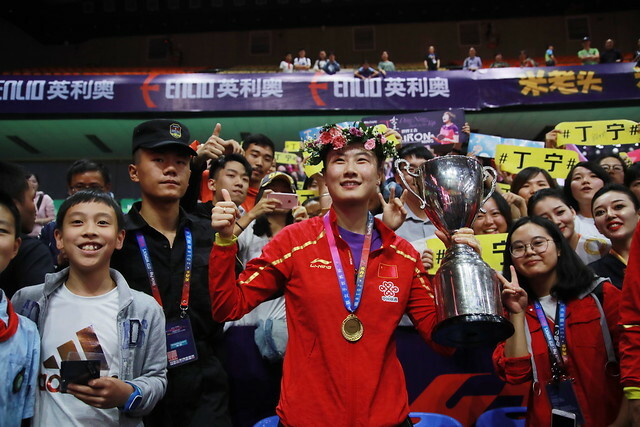 Additional to her efforts in Sendai and Markham, in 2013 in Kobe she reached the quarter-final round losing to Feng Tianwei, the following year in Linz it was a semi-final exit at the hands of the eventual winner, a certain Ding Ning, her biggest challenge in Chengdu. Nevertheless, of the chasing group, does Kasumi Ishikawa not start proceedings as the player in the best form? In August at the Asian Games Cheng I-Ching experienced a quarter-final exit, losing to Singapore’s Yu Mengyu; it was the same on the Seamaster 2018 ITTF World Tour for Miu Hirano. In Bulgaria, China’s Liu Gaoyang ended progress, in the Czech Republic it was her colleague, Saki Shibata. Likewise, for Kasumi Ishikawa, it was a last eight exit in Bulgaria but it was gold in the Czech Republic, beating China’s Wen Jia in the final; the problem in Chengdu for Kasumi Ishikawa the player against whom she lost in Bulgaria, the champion elect, a certain Ding Ning.